Whether you prefer inland or (superior) Great Lakes beaches, you need to educate yourself when it comes to beach testing. Michigan's BeachGuard system at http://www.deq.state.mi.us/beach. Beach testing in Michigan, for instance, occurs usually from Memorial Day through Labor Day. There aren’t enough funds to test all the state’s public beaches. And there aren’t enough decent media outlets that know how in the hell to inform the public about beach closings. Yeh, it’s a pet peeve of mine. First off, the state maintains a database of beach testing by health departments. Your local health department probably doesn’t publicize that. They send out nice, carefully worded news releases to the media saying the water at Beach A “didn’t meet state water quality standards for full-body contact recreational activities” or something like that. Then they say another notice will be issued when bacteria levels subside. Ah, nothing to worry about folks. Just wait. The bacteria will go away eventually. There will be another weekend. And summer is like, six weeks long in Michigan! Where does this mystery bacteria come from? People and animals, usually, as in wastewater plants, septic systems that don’t work correctly, or farms. Michigan uses E. coli bacteria to indicate the presence of disease-carrying organisms. OK, so here’s how the database works. It shows a map of the state with beaches that are closed or under advisory. 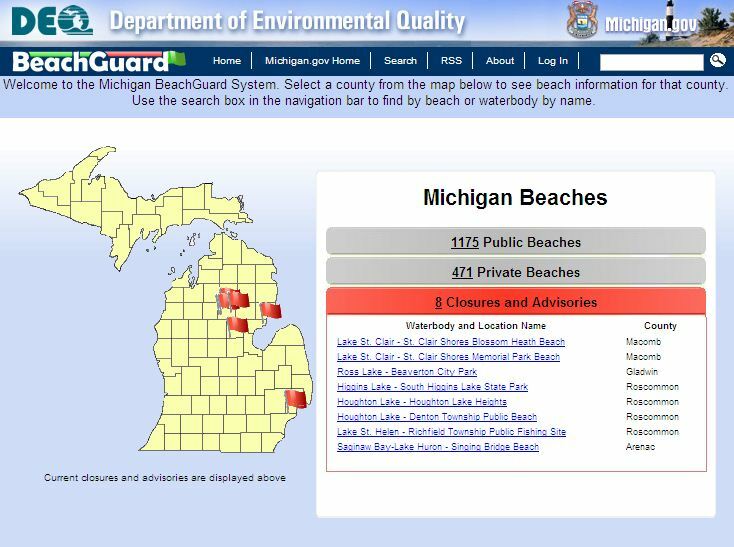 As of this writing, there are eight beaches closed in Macomb, Gladwin, Roscommon and Arenac counties. But that’s all you need to know, don’t read any further. Thanks for staying with me. You need to dig further to find out the good stuff, or in this case, the straight poop. Let’s take South Higgins Lake as an example, since I spent many of my formative years there. Click on the tab that says “Sampling Results” and look at the numbers. There are Daily and 30-day values. But all you have to know is that the daily standard is 300 colonies of E. coli and the 30-day standard is 130 (read the .pdf if you want). The Daily Mean for South Higgins on June 16 was 665.72, more than double the standard. More than double the level that’s considered safe, with bacteria levels that won’t make you sick. Say it with me, diarrhea. Just in time for the weekend. The reason I get into this level of detail is because just saying “the beach is closed, and bacteria levels will subside” isn’t good enough, folks. The law requires health departments to report this E. coli reading info, but they don’t advertise it. Bad for tourism, people. No crap. I mean, lotsa crap is bad for tourism. The next time you’re planning a trip to the beach, check the database. And call your health department if the data isn’t posted online. And bug your county commissioner, state representative and state senator, if necessary, if you don’t get a good answer. Better yet, call them even if the data is online. Use your outdoor voice.